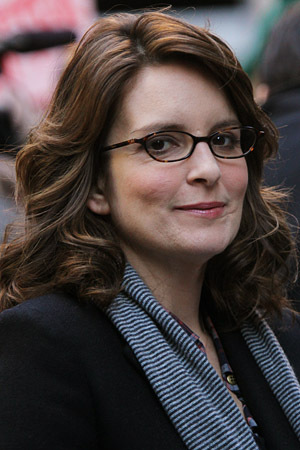 Former 30 Rock star Tina Fey is like that cool and wise older sister we always wanted. In honor of her 43rd birthday, we’ve put together 10 reasons why she’s the best role model for girls. Tina Fey didn’t become the first female head writer at Saturday Night Live by following the pack. She vehemently rejects the notion that “women aren’t funny” — ’cause, well, we are — and tells girls to follow their dreams, glass ceiling be damned. Also, she thinks it’s OK for women to use their femininity as an advantage — to a point. “I find that, if it’s genuine, if something is so frustrating that you cry, that actually often scares the s**t out of people,” Fey told James Lipton recently on Inside the Actors Studio. It would have been easy for Fey to think of her fellow SNL alum, Amy Poehler, as her competition. Instead, they became BFFs. Someone doesn’t like you? That’s a good thing, according to Fey. “Do your thing and don’t care if they like it,” she writes. “Don’t eat diet food in front of other people. Don’t eat like a Lean Cuisine. It weakens you. Eat it privately,” she writes. OK, this can be interpreted in a variety of ways. But basically, she’s telling women to go ahead and eat that damn cookie. Fey went back to work just five weeks after giving birth to her first daughter, Alice. She’s shown girls that it’s possible to have a successful career and a happy home life. However, she doesn’t pretend it’s not difficult. Taylor Swift wasn’t too impressed when Fey and Poehler made a slight joke about her love life during the 2013 Golden Globes. She later called them out for it in a Vanity Fair interview. Fey is one gorgeous woman, but beauty fades — and women better have something underneath all that pretty to show for it. “If you retain nothing else, always remember the most important rule of beauty, which is: who cares?” she writes in Bossypants. You know how some celebrities are just “too cool for the room” and their opinions about everything matter? Fey doesn’t feel that way. “It is an impressively arrogant move to conclude that just because you don’t like something, it is empirically not good. I don’t like Chinese food, but I don’t write articles trying to prove it doesn’t exist,” she writes. Happy Birthday, Tina! We hope we’re half as cool as you someday. PHOTOS: Happy b-day, Megan Fox! 15 reminders why she’s still… a fox!